Besser Co. has been named the exclusive manufacturer of molds for the Omni Block insulated cementitious masonry unit wall and PaveDrain Permeable Articulating Concrete Block/Mat (P-ACB/M) systems. The patented Omni Block combines the benefits of indigenous aggregates, expanded polystyrene cavity inserts, thermal lag (heat flow delay, disruption and redirection), exposed thermal mass (heat absorption), and air tightness resulting in a thermally efficient wall system. It delivers building professionals a host of benefits, Besser notes: An insulated “stand-alone” structural system, it does not require furring strips, additional insulation, or drywall to complete the wall, even though numerous finishes may be added for aesthetic purposes. The system has been used in residential and commercial buildings. Separately, Besser will produce molds for the PaveDrain system, a performance pavement that integrates a patented arched reservoir to maximize onsite storm water retention capacity during extreme weather events. The P-ACB/M improves the typical storm hydrograph and increases environmental performance while reducing storm water infrastructure requirements. PaveDrain mats can be pre-assembled in a variety of configurations customized for specific applications and installed quickly with conventional construction equipment. “New products are one of the keys for the growth of our industry. We are excited to partner with PaveDrain to maximize the impact of this innovative new product on the construction marketplace,” says Besser CEO Kevin Curtis. “Partnering with the industry leader gives [us] access to unparalleled resources that are focused entirely on serving the global concrete products industry,” adds PaveDrain President Doug Buch. 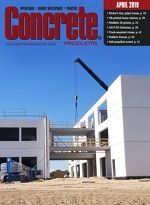 Besser will display the Omni Block and PaveDrain offerings at The Precast Show (Booth 1200), March 1–3 in Orlando.